I’ve travelled to London today to meet up with some friends. 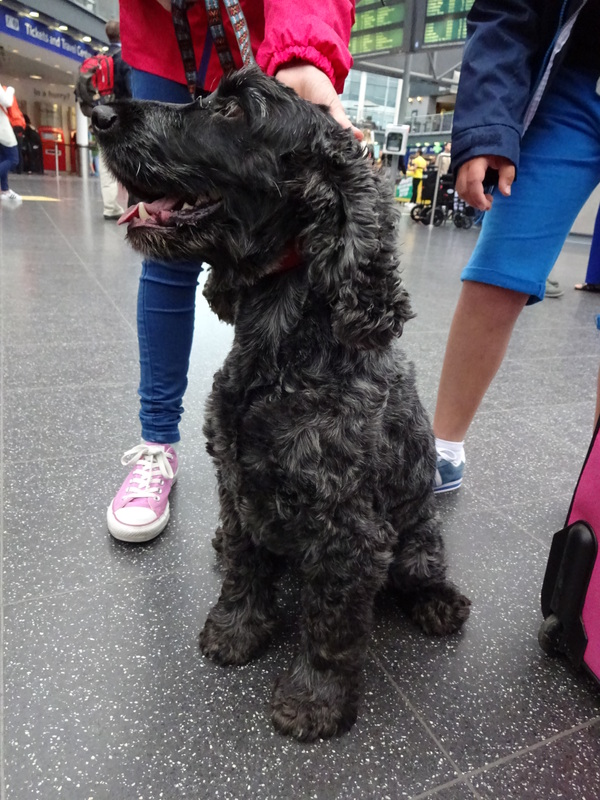 I wasn’t sure how easy it would be to spot a dog in central London as I haven’t been since I’ve been doing my blog but as it turned out I spotted a lovely dog at Manchester Piccadilly train station! Freddy is a very handsome, friendly Cocker Spaniel. He’s very active, he hardly kept still! Freddy was going on a trip with his human mummy, sister and brother, I hope they have a good time! When people come to his house Freddy put his ear in his mouth and carries it to the front door to greet people, how sweet! Favourite food: Anything, Freddy is greedy! Favourite toy: A rope toy. Freddy likes to chew it and hide it under the bed. Favourite pastime: Walking in the park and sleeping!